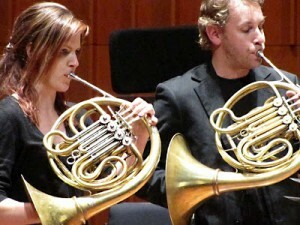 Andrew Bain is the Horn Instructor at the Colburn School Conservatory in Los Angeles. In addition Andrew has presented Masterclasses and Workshops throughout Asia, Australia, Europe and the United States. Andrew's enthusiastic, refreshing teaching style and background as a performer of symphonic, opera, ballet, musical theatre, chamber music and solo repertoire make him a valuable resource for the development of your students. Having won Principal positions in prestigious orchestras in Australia, Germany and the United States, Andrew has invaluable insight into Mental Training, Audition Preparation and experience in the important transition to obtaining tenure. Andrew can tailor a Masterclass or Workshop to suit the needs of your studio and provide an outstanding learning experience for your students. For information on engaging Andrew to present a Masterclass or work with your students please go to Contacts.